The projected cost of the identity card scheme will be £5.612bn over the next 10 years, the Home Office says. The figures, which are for October 2007 to October 2017, cover the set up and the operational expenses of the scheme. 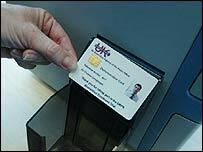 Biometric identity cards will be brought in for foreign nationals from 2008 and from 2010 all UK passport applicants will be issued with them. Lib Dem spokesman Nick Clegg said it was a "vast waste of taxpayers' money" which should be spent on more police. The Conservatives also oppose ID cards and say they would scrap the scheme in favour of a dedicated border police force. Under the Identity Card Act, the government must give figures on the costs twice a year. The Home Office says that "greater understanding of the work required and current experience of the Identity and Passport Service" had led to a change to the assumptions made on likely costs. The first change is an £85m cut because of a reduction in the forecasts for numbers of passports needed over the next decade "due to customers delaying passport renewals". The second change is a cut in the estimated cost of producing and delivering "passports and identity cards containing a fingerprint biometric of £100m". These reductions mean that the estimated cost of the identity card scheme for the 10 years from October is lower than the £5.75bn given in May. However, when those new assumptions on likely costs are applied to the figures given in May, it shows that the rolling ten year cost of the cards scheme has increased by £71m on six months earlier. The Home Office said this was a result of the period including six more months - April to October 2017 - when there would be a fully operational ID cards scheme. But its report also notes that "as with any cost estimates covering a ten-year forward period, there are considerable uncertainties" and that "there is a significant probability that the estimates will change in the light of further experience". Mr Clegg, the Lib Dems' home affairs spokesman, said: "It is becoming more and more clear that identity cards are going to be a vast waste of taxpayers' money. "The fact that the cost keeps changing shows how loose a grip the government has got on the finances of this ill-judged scheme." He said they should be scrapped in favour of "something that will actually cut crime - more police on the street". Phil Booth, of the anti-identity card group No2ID, said the Home Office was "keeping billions off the true cost of the scheme". He said: "The conveniently sliding budget looks only to the rosiest future, and fails to acknowledge the biggest black hole of all, compulsory interrogation of the entire adult population." And Mark Wallace, of campaign group the Taxpayers' Alliance, said even without problems, the current cost estimate represented a "heavy burden" for taxpayers. The government says that ID cards will help protect people from identity fraud, will tackle illegal working and illegal immigration, and disrupt criminals and terrorists' use of false identities and ensure free public services are only used by those entitled to them.